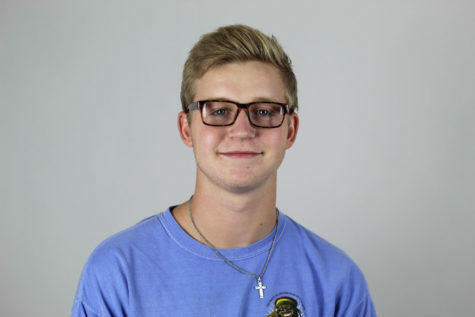 Entering his fourth and final year on The Red Ledger staff, senior Drew Doig will continue to be a sports writer. Drew, or “Doig” as he’s more commonly called, is a member of the varsity basketball team, National Honor Society, and Fellowship of Christian Athletes. Outside of school, Doig enjoys hanging out with friends and watching sports. A fan of everything Auburn, Doig plans to attend Auburn University. However, with major persuasion from his brother Grant, he could end up attending the University of Arkansas. Doig also enjoys playing video games and will take on any worthy opponent in NCAA 14 or NBA 2K. You can find Doig on the grill as he enjoys throwing on a nice New York Strip with fellow senior Kyle Olson. He enjoys watching The Office and will recite a line from Dwight Schrute when need be. Doig hopes that his wealth of experience on the staff and expressive personality will land him on the TRL’s heralded “RIP wall” next to some of the all time greats that came through E103. Doig couldn’t be more excited to be on the staff for his senior year along with fellow veteran Joseph Vastano, and he’s ready to take the class to an elite level.